As endurance athletes we spend hours upon hours developing our cardiovascular system, preparing our bodies for the demands of competition, but, do we ever stop and consider the possibilities of training or minds? On such way of doing this is through the implementation of psychological skills training or PST. PST can be defined as consistent practice of psychological skills to enhance performance, increase enjoyment and increase self-satisfcation1. What’s not to like about this! The below will outline three methods I personally use and would suggest for you to use also, as always, these methods are backed up by a sound scientific base. 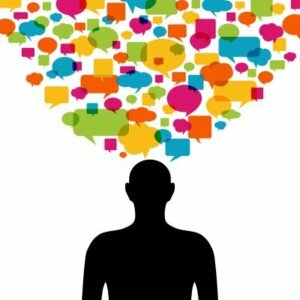 Managing self-talk is one of the most important PST methods within sport, it is linked to the area of skill acquisition and ultimately increased performance. We’ll split self-talk into three areas; Positive, Negative and Neutral, all of these may lie somewhere on a continuum and like anything there is no definitive “black or white” answer. Think of self-talk as that voice in your head saying things such as “I’m a failure, I can’t do this”, etc. This form of self-talk is obviously negative and has been shown to decrease performance in sport2. On the opposite end of the spectrum positive self-talk has been shown to increase calmness and centring (the here and now aspect)3. Essentially an athlete wants to minimize this negative self-talk, there are many ways to do this including self-monitoring, goal directed thinking and the use of trigger words. Self-monitoring can include the use of activities such as journaling, so, when an athlete experiences a negative dialogue they focus their attention on it and write it down – the first step in combating something is accepting it! Goal directed thinking involves the establishment of processual goals rather than a purely outcome orientation. In cycling terms, we would break a race into smaller “chunks” for example being in the right position for a climb or focusing on our nutrition, in theory these should lead to the desired outcome whatever that may be. Trigger words can also play a part in the prevention of negative self-talk. Words such as breath, relax, focus cross over into every sporting situation and help focus attention back to the task at hand. In a study of elite modern pentathletes it was found that all of those sampled had some form of pre-performance routine which prepared them both physically and psychologically for competition4. Taking a practical stance examples of pre-performance routines for you may involve a specific music playlist, a specific warm-up (practiced in training) and pre-competition meal times. Employing a basic routine allows you to focus on performance by increasing the familiarity to the environment surrounding competition. This will aid in increasing calmness, focus and improving anxiety levels. Arousal can be viewed as your state of readiness to perform, it can be increased and decreased but it is highly important to find your “optimum zone of arousal”. An illustration of this can be seen in figure 1. 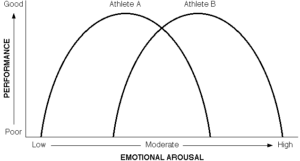 This figure known in short as the IZOP (Individual Zone of Optimum Performance)5 provides us with a framework to model individual arousal states i.e. low, medium and high on a continuum. Your optimum zone lies on this continuum and it is key to build awareness on where you need to be for that “optimum performance”. How does one find this zone? It is found through basic self-reflection on previous performances and where your arousal state lay on this continuum, you then make the effort to revisit this state for future performances! If you find you need to increase arousal levels before competition then the use of trigger words, music and imagery may help in this department. On the other end of the scale if you find you need to decrease arousal levels you can try techniques like progressive muscle relaxation or counting one’s breaths or even exhaling for a set number of seconds. The above post defines, in brief, how one can use PST to alter and improve their performance. It is important to note that any attempt to try these solely on the day of competition may be in vain – you need to consciously implement them as part of you overall training approach just like you would in other facet of your performance. So, make a conscious effort to employ these skills and you may notice as increase in, number one, your enjoyment for your sport and number two an increase in performance come race day! 1 Weinberg, R., & Gould, D. (2007). Imagery. Foundations of sport and exercise psychology. 4th ed. Champaign: Human Kinetics, 295-319. 2 Van Raalte, J. L., Brewer, B. W., Lewis, B. P., & Linder, D. E. (1995). Cork! The effects of positive and negative self-talk on dart throwing performance. Journal of Sport Behavior, 18(1), 50. 3 Carr, C. M. (2006). Sport psychology: psychologic issues and applications. Physical Medicine and Rehabilitation Clinics, 17(3), 519-535. 4 Bertollo, M., Saltarelli, B., & Robazza, C. (2009). Mental preparation strategies of elite modern pentathletes. Psychology of Sport and Exercise, 10(2), 244-254. 5 Hanin, Y. L. (1997). Emotions and athletic performance: Individual zones of optimal functioning model. European yearbook of sport psychology, 1, 29-72.